“ABCD” (c.1920; see Dietmar Elger and Uta Grosenic, Dadaism [Taschen, 2004] 40). 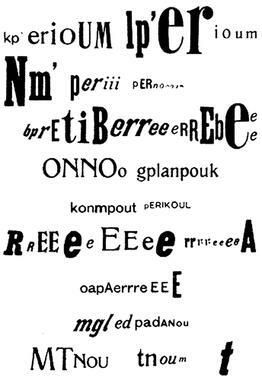 He developed typographical experiments into collages into what he called “phonemes,” or more exactly, the practice of opto-phonetics, that is, “the science of visible speech sounds,” probably the model for Kurt Schwitters’ “Ursonate” (1922-32). 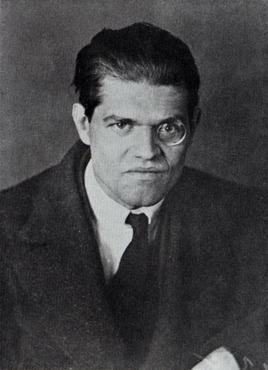 Such constructions embodied the Dadasophy he created for Berlin Dada that embraced “destruction as an act of creation,” a schizo-aleatory process (Dada . . .); at the same time, when read aloud, they disconnected phonetics from semantics and became “exercises in strange forms of vocalisation and sound production” (Cornelius Brock, “Sound Work and Visionary Prosthetics: Artistic Experiments in Raoul Hausmann,” Papers of Surrealism 4 [Winter 2005]: 16).